Importer Summer Infant, of Woonsocket, R.I.
Incidents/Injuries Summer Infant has received 22 reports of overheated batteries, including incidents of smoke and minor property damage. 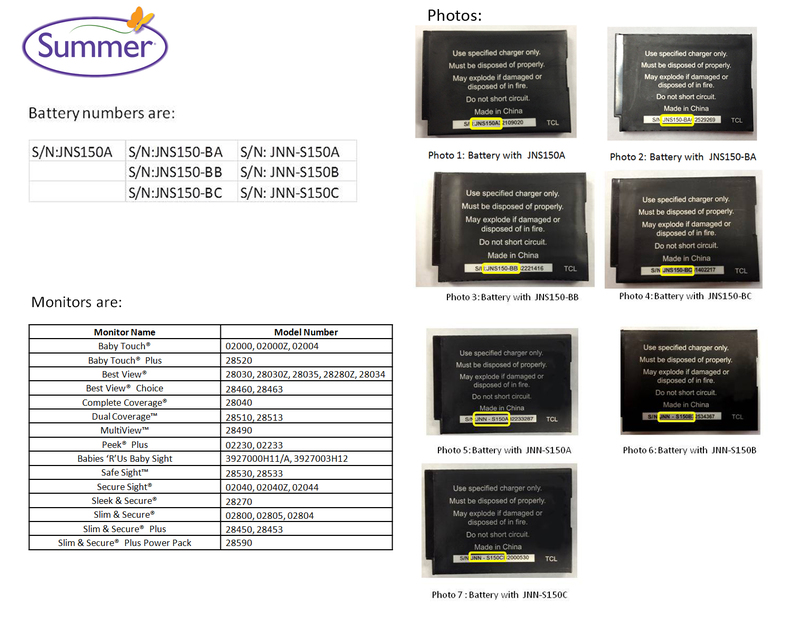 Description The recall involves rechargeable batteries in certain Summer Infant handheld color video monitors. The rechargeable batteries in the monitors are about 1 ½” tall by 2 ¼” wide and are ¼” thick, black, and are marked with TCL on the lower right corner of the battery. Monitors are sold with a matching camera and A/C adaptors. The rechargeable battery can only be found in the monitor. Batteries that may be affected will include a letter & number combination in the beginning of the serial number on the back of the battery. Click here to view all affected batteries. Contact Open the back compartment of your monitor handheld unit and check your battery's markings. For easy reference on how to check the battery in your Summer monitor, click here. If your product is affected, please click here and complete the form as directed. After the form has been completed please hit "OK" to submit. Replacement batteries are due to arrive at Summer Infant by July 11, 2014. Once they have been received you should receive your replacement battery within 7 to 10 business days. You will also receive a postage paid envelope to return your old battery for proper disposal.